South by Southwest isn’t just a tech show—it’s more of an ideas show, a place where technology comes together with art, music, and film in creative ways to bring these outside-the-box concepts to the people. Well, I guess in the case of the Infinity Room, the point is to bring people inside the box. 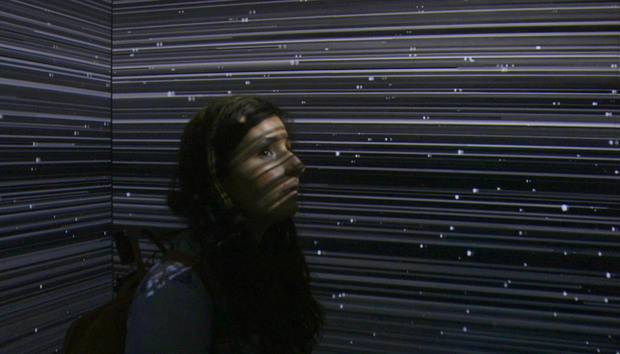 The Infinity Room is an installation by mixed-media artist Refik Anadol that uses trippy audio and visuals to create an illusion of infinite time and space. The room is a completely closed-off box with projectors on each of the four walls, and mirrors on both the floor and ceiling that make the space feel much bigger than it actually is. Looking down was a little freaky—it looked like I was suspended in midair. There are different iterations of the Infinity Room popping up in museums and galleries all around the world, and it’s definitely worth checking out if you get the chance. Or, watch the video above to get a better idea of what the room is all about.